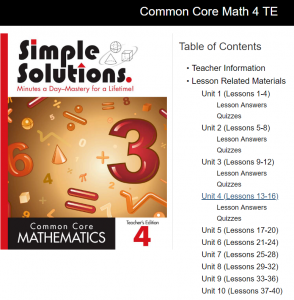 Teachers who use our Simple Solutions books in the classroom are going to find a nice surprise when they open their digital teacher editions at the start of the school year. The new update makes these editions easier than ever! Everything that you love about the S²TaR Center (The Simple Solutions Tools and Resource Center) is still there. In fact, the Resources, Worksheet Generator, and Digital Quizzes have stayed the same. Just the Teachers Editions have been updated. 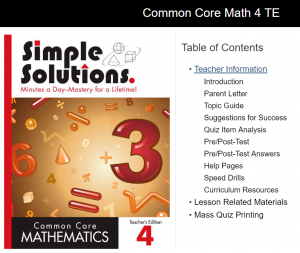 Teachers will notice that it is much easier to navigate through the digital teacher editions. Instead of locating a table of contents, or clicking through pages, a simple drop-down menu puts everything you need to find at your fingertips. Under the Teacher Information drop-down menu teachers can clearly see all the information that is needed to start off the year. Teachers will find parent letters, topic guides, and suggestions for success. 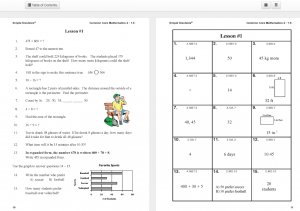 Teachers can also find the Pre/Post-Test, Help Pages and Speed Drills. Use this section to help you navigate through Simple Solutions, whether you are a new user or a long-time adopter. Simple Solutions is used daily by classroom teachers, so it is important to be able to access the answers to the lessons so that students will be able to self-check their work. The new update organizes the lessons neatly into weekly units. Each unit includes the 4 lessons for the week, (questions AND answers!) as well as the A and B quizzes and answers. Allowing teachers to easily find each of the lessons without taking time away from the class! The buttons at the top right-hand side of the lesson allows the lessons to be displayed two pages at a time or one page at a time. Having the answers right next to the questions in the digital teacher editions is the new feature that we have heard great feedback from! It is much easier to go over difficult problems when the questions and answers are displayed together. 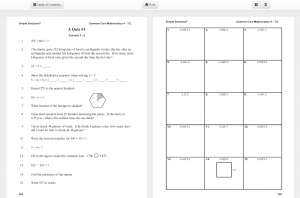 Printing quizzes has also been made easier with the new update. The print icon is at the top of each of the quizzes. Simply clicking the print button will send that quiz directly to the printer that is installed on your computer. 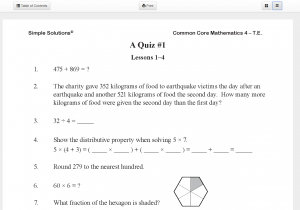 The last drop-down menu allows teachers to print all 35 A or B quizzes at one time. This time saving option allows teachers to plan their year and have quizzes ready to go each week. This year will be better than ever! The newest update to our S²TaR center is sure to start you off on the right foot!